Donald Altman, M.A., LPC, former Vice-President of The Center for Mindful Eating, has a newly released book: The Mindfulness Toolbox: 50 Tips, Tools & Handouts for Anxiety, Depression, Stress & Pain. ** Easy "bundling" of related practices... such as somatic-oriented; or breathing-oriented. Each bundle lets you put together an entire practice module for clients. ** Ways to Tap a client's learning style. If your client has a visual, tactile, or verbal learning style, you can quickly locate tools that will 'fit' most easily with your client. The diversity of tools is what makes this book different stand out, and for me personally, makes it a special and highly useful book for therapists and clients alike. Please check it out on Amazon (they have a special discounted price). Thank you and may you find this book of benefit in your professional and personal practices. Spring 2014 Food for Thought: What is Mindful Eating? In our 2014 Spring issue of Food for Thought on the topic of What is Mindful Eating? we get back to basics as we give definition and form to the principles and practices of mindful eating. Our feature article by Char Wilkins, MSW, LCSW, entitled "Happy Food" reminds us that we won't be mindful of every mouthful, and that's okay. She explains, "Just as my plate is a picture of contrasts – spicy and cool and soft and crunchy – so is the way in which I eat the food: moments of mindlessness and moments of awareness." Cheryl Wasserman, MA, LPC, NCC, asks "What is it that we are truly hungering for?" as she explores the meaning of mindful eating in her article entitled, "What is Mindful Eating." Megrette Fletcher, MEd, RD, CDE offers a guidance in "Starting a Mindful Eating Practice". With mindful attention, she suggests, "See what is good about the bite before you. This mental shift sprinkles delight, curiosity, contentment, joy and anticipation onto your meal." As always, we've designed the practice handout to be a separate download that you can share with your patients or clients. Download the Starting a Mindful Eating Practice patient care handout. Please enjoy our new extended format of Food for Thought featuring a message our new Board Members Corner and our Community Sharing page. Thank you to our community members for participating in this issues survey "What is Mindful Eating.' We greatly appreciate your sharing many words of wisdom about mindful eating, it's benefits and ways of practicing. We are now publishing our Food for Thought newsletter on ISSUU for easy reading on your tablets, iPads, even your phone. Thank you to Eric at Winter Crow Studio for being our amazing designer. You were great to work with! 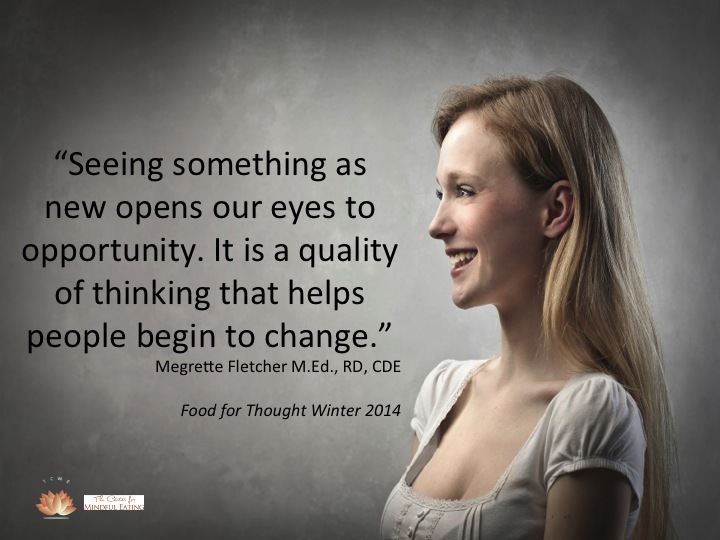 View previous issues of Food for Thought for more mindful eating ideas, benefits and practice approaches. The Center for Mindful Eating is 100% member-supported. Please consider becoming a member, or making a donation, to support our work providing free mindful eating education resources. Coming up in April we have two teleconferences being offered by two of our TCME board members. We'd like to take this opportunity to introduce you to Char Wilkins, MSW and Cheryl Wasserman, MA, LPC, NCC. Char will be offering "Happy Food" on April 14th and Cheryl will be leading a teleconference titled "What is Mindful Eating" on April 24th. Char Wilkins is a mindfulness-based psychotherapist who works with individuals, couples and groups incorporating the intention and skills of mindfulness as a foundation from which to explore one’s life. She specializes in working with stress-related physical and emotional issues, with women who have experienced childhood abuse and trauma, and those who suffer with depression, anxiety and disordered eating. Char recently had an article on mindfulness and women who have experienced childhood abuse published in one of her profession's publication, Social Work Today. In the article, Mindfulness, Women, and Child Abuse: Turning Towards What Is Difficult, she writes about the intersection of abuse and disordered eating. She plans to publish a second article this year specifically on mindfulness and eating disorders. Char maintains a longstanding personal meditation practice and is currently studying Qigong and Taijiquan. She writes: "Mindfulness meditation is about cultivating a gentle curiosity about yourself. Most of us go through life on "automatic pilot." Being mindful is about being less in the future and past, and more in the present moment so that your life doesn’t pass you by. It’s learning to focus your mind when and where you want it, and about becoming less judgmental and more trusting of your own wisdom so that you can make wiser choices about your life." Char is the owner/director of A Mindful Path, LLC which was created to provide programs that allow people the opportunity to explore ways to live more mindfully. "Mindfulness is learning to pay attention in a non-judgmental way, in the present moment to our thoughts, emotions and physical sensations, which in turn allows us the possibility of choosing how to respond rather than react to people and events in our lives. Being mindful is a way to connect your mind and body so that you can fully engage in life, enjoy each day, and take care of yourself." Cheryl Wasserman is a psychotherapist who owns Alliance Therapy Associates and is a partner in Westport Wellness Group. She teaches mindfulness for the treatment of depression, anxiety and stress. She also trains other psychotherapists who wish to incorporate mindful eating into their life and professional practice. Cheryl began meditating 30 years ago. She maintains a daily mindfulness practice in an effort to bring genuine mindfulness to her work with others, especially as applied to eating. Cheryl was put on her first diet when she was 5 years old. She describes beginning her “dieting career” of one form of suffering after another until she began her meditation practice, mentioned above. "I began to meditate in order to deal with the stress of going back to college to get my Master’s degree in counseling with 2 young children. For the first time in almost 30 years, food and eating began to recede into the back of my mind. Without effort, weight began to fall away. As I’ve looked back on my situation, I believe that my meditation practice allowed me to see my maladaptive patterns without judgment (on my “good” days) and to get in touch with my Wiser Self to make choices informed by what my body was telling me." In her private practice of 25 years, Cheryl has primarily specialized in weight management. She uses a non-diet approach believing that mindful eating really helped her clients settle down to observe their relationship to food without self-recrimination. Please join us in celebrating both of these mindful eating practitioners by attending one of their teleconferences this month. We are very pleased to announce that we are expanding our online services to include professional training listings by our members. If you are a professional in any discipline who offers CPE/CEU/CME accredited programs that include a focus on mindful eating, we invite you to share those trainings so that we may include them on our Professional Development resource page. This service is offered to members-only, and will be free through July 31, 2014. See our Professional Trainings Listing page to submit your application to list your accredited workshops or training programs. And as a reminder, every member can list any trainings, workshops or retreats that they are offering in their personal TCME profile. When people use our Find a Professional Network they will see you, and your offerings, further strengthening the web of connections we are forging in the mindful eating community. What does it mean to be mindful? We'd like to know what you think! What does it mean to be mindful? How can you best achieve mindful eating? This Spring we will be focusing on bringing definition and form to the practice of mindful eating, and we'd like to hear from you about what you think. What working definition do you use to explain mindful eating to your clients, friends, family and colleagues? Later in the year we will have a focus on taste and dealing with anxiety. We will be creating surveys each quarter to ask for your input on these themes. What has worked for you? What insights do you have to share? Eating disorders (ED)– such as anorexia nervosa (AN), bulimia nervosa (BN), binge eating disorder (BED), and eating disorder not otherwise specified (EDNOS - ) have at their core extreme emotions, attitudes, and behaviors surrounding weight, body image, and food issues. Mid-week into the National Eating Disorders Awareness Week, we are reminded that, in addition to the fact that a large proportion of eating disorders go undetected, rarely is mindfulness or self-compassion added into the therapeutic mix for those suffering from them who do receive care. This is particularly important due to the negative way most sufferers have come to relate to themselves. For those suffering from an ED, nourishing the heart and spirit is as important as refeeding their bodies. Self-compassion can be an invaluable tool to relate differently to extremely critical thoughts and emotions which hinder the path towards recovery, and can also help in dealing with the stigma commonly associated with ED, as with other types of mental illness. Binge eating disorder (BED), now included in the DSM-V, is the most common eating disorder, particularly in older individuals, and for women and men. It is characterized by extreme imbalance in food intake regulation, and is often co-morbid with obesity and depression. Mindfulness-based approaches may reduce compulsive overeating, address associated behavioral and emotional disregulation, and promote internalization of change. Mindfulness-Based Eating Awareness Therapy (MB-EAT), developed by Jean Kristeller and her colleagues, has been shown to be effective in treating BED and was well received by participants. See the following two papers for a conceptual overview of this approach for treating BED and the results of NIH-funded randomized clinical trial. Later today we are offering a free teleconference for members titled ‘The Self-Compassion Diet´ with Harvard Medical School-affiliated psychotherapist Jean Fain, MSW, LICSW. After providing a working definition of this guiding meditative principle, Jean will review the cutting-edge research, and put the findings into a useful therapeutic context. Participants will learn updated self-compassion practices that are proving beneficial for the range of eating issues. If you are not yet a member of TCME, join us now to get access to this teleconference, and many more! If you haven’t taken some time to explore the resources available on The Center for Mindful Eating website in the last few months, you might be missing out on some wonderful opportunities. If you are interested in learning about the growing body of research in mindful eating you can satisfy this craving by reviewing the Mindful Eating Bibliography. Quench your thirst for learning by looking at our reorganized Teleconference Recordings Archive or enjoy a small snack by sampling one of our Professional Handouts. 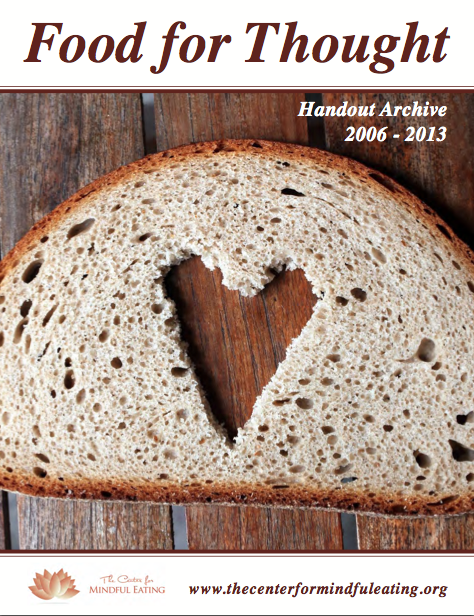 The Professional Handouts is a newly complied collection of Food for Thought Professional Handouts, which spans thirty topics and a dozen authors. To help professionals deepen their understanding of mindful eating, TCME.org is offering a short training course and offer CPE's titled Explore the Food for Thought Professional Handouts. Facilitated by Megrette Fletcher MEd, RD, CDE. This two-session, 4-hour training that will explore about half of the 30 Food for Thought Professional Handouts in significant detail in terms of content and how to use and apply these concepts in your practice. Learn how to introduce topics like Loneliness, Fear, Permission, Curiosity, Compassion, Balance, Acceptance and Forgiveness with your clients. • Two ways to introduce the concept of mindful eating to clients. • To identify three ways that mindful eating can change eating habits. Up to 4 CPE's are available to TCME members who participate live in both sessions of this training teleconference. If you are only able to attend one session, 2 CPEs will be issued. Register for both Part I & Part II together and save $5. Save $20 on both sessions when you JOIN The Center for Mindful Eating! We hope to see you at this special training - and wish you well in your mindful eating journey. What does it mean to be mindful, and how can you best achieve mindful eating? "Mindful eating isn't something you just read about, you have to do it." Jan Chozen Bays, Roshi, M.D., is a pediatrician specializing in work with abused children. She is the author of Mindful Eating: A Guide to Rediscovering a Healthy and Joyful Relationship with Food and How to Train a Wild Elephant and other Adventures in Mindfulness, both published by Shambhala. She has studied and practiced Zen Buddhism since 1973, serving as the teacher for the Zen Community of Oregon since 1985. In 2002 she helped to found Great Vow Zen Monastery near Portland, Oregon, where she serves as co-abbot. She has published articles about Zen in Tricycle and Buddhadharma magazines. Jan is a wife, mother, contented cook and avid gardener. We are pleased to introduce Mary Farhi, MD, who joined the TCME board last summer. She will be offering her first teleconference with us on February 18, 2014 entitled "Creating Wellness". Mary currently practices gynecology, with a focus on wellness, in a private practice setting. Additionally, she, along with her husband, operate a yoga and resistance training program, Yoga Bent. In addition to her busy medical practice, Mary lectures in her local community about wellness and stress reduction, especially for women in menopause, incorporating teachings about how to use mindfulness to support health during life transitions. We thought you'd like to get to know a little bit about her, she writes in response to our questions about her own personal practice: "I aspire to practice meditation and yoga formally each morning at home. I teach a weekly yoga class that I call “Mindful Yoga” and also continue to attend yoga classes weekly as a student. I participate in a guided group meditation that meets monthly and informally I try to be aware of incorporating mindfulness into my daily life as well as my clinical practice in gynecology. I hope to plant the seed of mindfulness in my patients as an option to consider on our path of wellness." Mary received her MD, as well as her MPH in Epidemiology from the University of Minnesota. She completed her 200-hour yoga teacher training at Kripalu Yoga Center in MA. She is a NAMS (North American Menopause Society) certified menopause practitioner as well as an active member of NAMS where she was in the inaugural program encouraging new researchers. There, her research focused on the association of Vitamin D deficiency and BMI. She has completed formal Mindfulness Training for clinicians with Jon Kabat-Zinn and Saki Santorelli at Mount Madonna in 2012, as well as a Mindful Eating Conscious Living professional training with Jan Chozen Bays and Char Wilkins in 2013 at Joshua Tree, CA. She has also completed an 8-week Mindfulness-Based Stress Reduction (MBSR) program with a local teacher in 2012. In November of 2013 she become certified by the American Board of Integrative and Holistic Medicine (ABIHM) and is currently completing training in Functional Medicine (ifm.org). Mary sees a large volume of women in her clinical practice that have health issues that, in part, arise from lifestyle choices. These range from hormonal imbalances that may affect fertility, insulin resistance and metabolic syndrome. She is interested in educating women regarding the effects of food and choices on health. She currently offers a weight management program privately for her patients, incorporating mindful eating. "Often I introduce the concepts from Mindful Eating in my office in order to educate, and most importantly, plant a seed about shifting their focus from “dis-ease” to wellness. I would say my primary interests are in medicine, specifically hormonal balance, metabolic syndrome, and insulin resistance, as well as education and mindfulness. I feel it is important to educate women that we need to look upstream to investigate what may be contributing to symptoms of dis-ease and consider all aspects, mind and body, in creating our personal wellness." Mary is a wonderful public speaker and loves facilitating workshops. We hope, as time permits (she is the mother of six boys! ), that she will find time to write and develop educational materials for The Center for Mindful Eating. But for now, we are very happy to introduce her, and her perspective, her work, her wisdom, in the upcoming teleconference, "Creating Wellness", scheduled February 18th, 2 pm EST. When w e were developing our new website, launched just last summer, we consulted with people in the field of marketing and education who gave us the feedback that we have some wonderful educational materials for Mindful Eating, but they are hard to find! Our efforts to bring our writings into a space that is more accessible bore some new fruit this past month when we contracted with Eric Wentworth of Winter Crow Studio to help us create a more interesting, readable, and ultimately more user-friendly way to access our collection of Food for Thought Professional Handouts. The outcome is delightful! We are very happy to introduce over 30 handouts written by a number of professional across multiple fields on the insights, practices, and approaches to mindful eating. We've published this Professional Handouts Archive on ISSUU - a tablet, mobile device and desk-top friendly way to read documents online. This is a great way to browse through our diverse and creative collection of approaches to mindful eating. The handouts in this archive are an ideal introduction to Mindful Eating and are listed here by their corresponding Food for Thought topic. In Cultivating Curiosity: A Curious Stance, (Summer 2007) Molly Kellogg, RD, LCSW, writes: "Curiosity can be a useful way to pay attention, a place to return to. We can at any time return to being curious by asking questions and waiting for the answer in the moment." And then there is Forgiveness. Ronna Kabatznick offers a wonderfully helpful Forgiveness Meditation: "To the extent that I am able, I forgive myself for any hurt or harm I have caused myself intentionally or unintentionally. For as long as it takes, I will continue to offer myself the priceless gift of forgiveness." (Ronna Kabatznick, Winter 2007). Char Wilkins, LCSW, a current member of the TCME board, offered a professional handout on The Power of Permission, in the Spring 2010 Food for Thought issue. She writes, "Giving yourself permission to have chocolate isn't the same as "giving in" or "giving up." Permission is a mindful agreement with yourself to allow yourself a favorite food. This requires slowing down, acknowledging feelings, sensations and thoughts, exploring choices, and making a decision. This process is very different from mindless behavior on autopilot." We still offer the most recent four Food for Thought issues and corresponding handouts on our public site, and members can access all of the individual PDF files of the handouts to download, print and share with clients and colleagues under our Creative Commons licensing.